Today, the CAHPS survey often doesn’t capture the entire picture when it comes to customer satisfaction. To meaningfully improve the patient experience, an organizationwide, proactive approach to patient-centered care is needed. 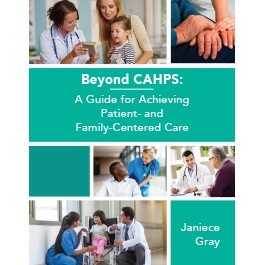 Beyond CAHPS: A Guide for Achieving Patient- and Family-Centered Care gives healthcare providers the knowledge to construct a top-notch patient experience. Janiece Gray is a co-founder and CEO of DTA Associates Inc., a healthcare consulting firm focused on helping providers achieve patient-centered improvement goals. Janiece and her team are uniquely positioned to partner with clinical care teams and operations leadership to develop custom solutions to enhance patient experience, improve clinical outcomes, and streamline processes. She has more than 20 years of experience in patient care, healthcare administration and operations, performance improvement, and patient experience.